Sheet Masks – why are we all obsessing over them? 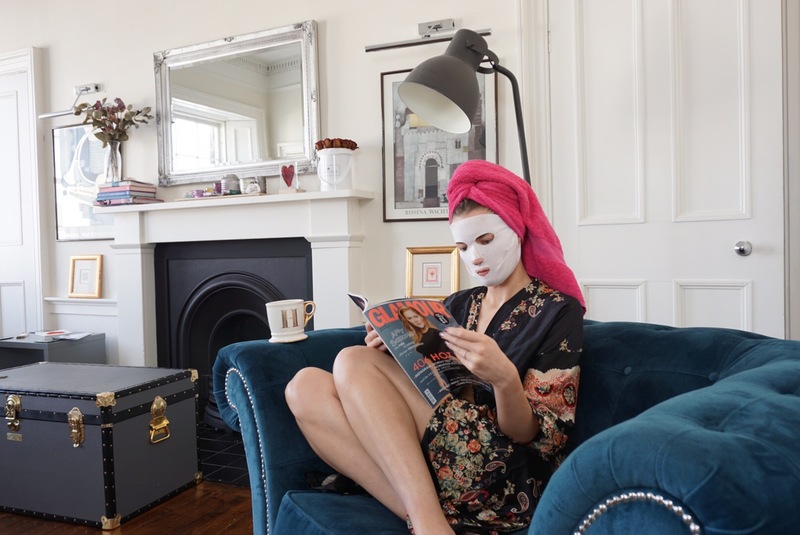 Sheet masks are taking over our Instagram feeds, but why?? New sheet masks seem to be popping up every day, I can pretty much guarantee that even if you haven’t tried a sheet mask you have seen one and thought WTF?!? So why are we all obsessing over sheet masks and what makes them better than the traditional face mask? They look strange yes, that is a given – but are they more effective? What even is a sheet mask?? 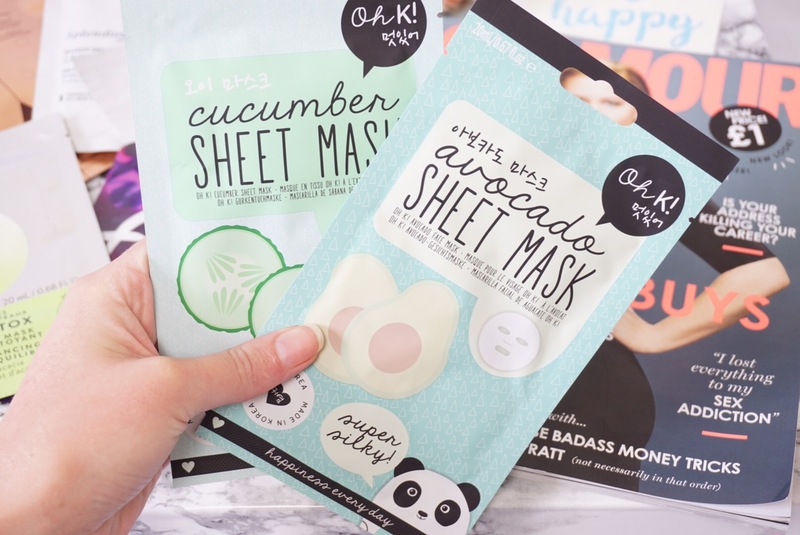 Stemming from Korean beauty rituals, sheet masks have made their way overseas to us. A sheet mask is a sheet made from cloth or paper that is saturated in skincare ingredients. The sheet acts as a barrier to prevent the formula evaporating so skin can absorb 3 x more than a liquid mask, physically sealing in the active serums underneath making the ingredients more effective with immediate results. It’s like force-feeding your skin some goodness! Generally sheet masks are applied to cleansed skin for 15 minutes … some Korean ladies do this every day as part of their standard skincare routine. Are sheet masks better than traditional face masks? In my opinion – yes. They are easier and less messy to use, with no need to rinse after like traditional masks. After removing, simply allow the excess product to absorb or massage into your skin. There is none of the normal mess of squeezing out the mask, getting it everywhere from under your nails to over the sink, to having to wash it off after. 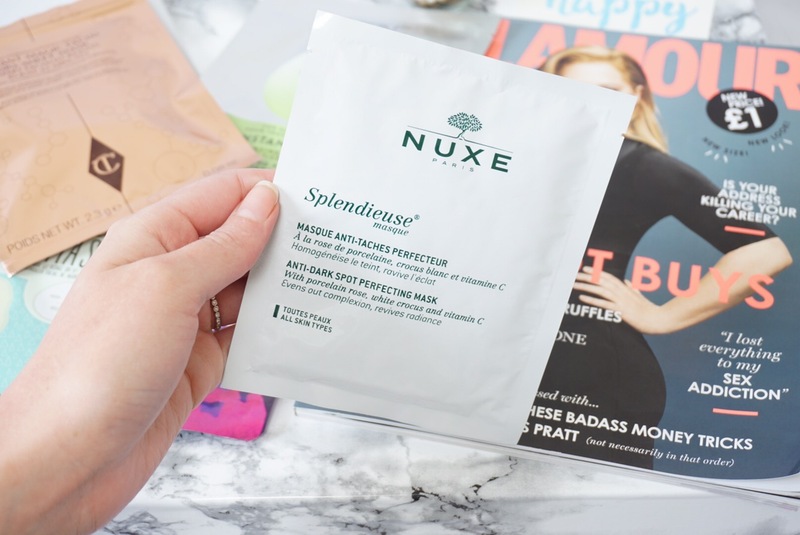 They are portable – from an overnight bag to a long haul flight, sheet masks are individually wrapped and easy to pop into your travel bag. Yes you may look slightly strange sitting on a plane with a sheet mask on your face, but if you’ve got the balls to do it I would say it is worth it to step off the plane looking like you’ve just had a facial! 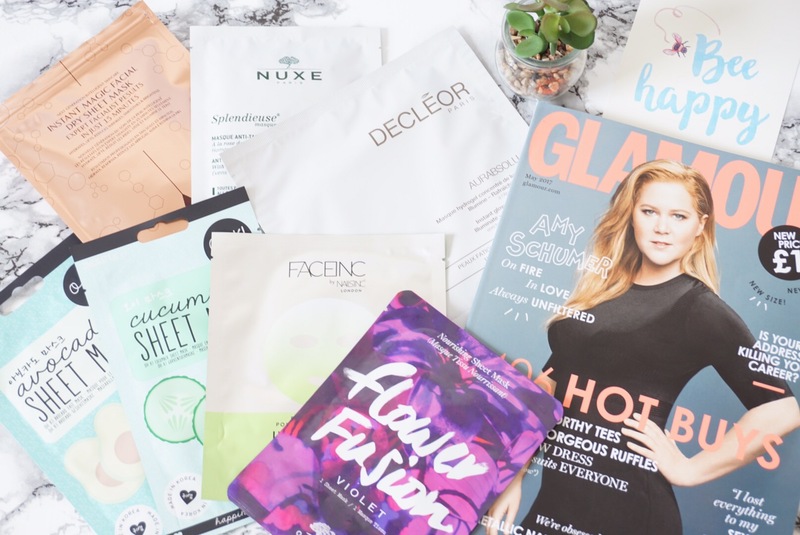 Sheet masks are the perfect little nutrition boosts for your skin when it needs an extra bit of TLC. They provide great hydration boosts and remember even if you are an oily skin type – you do not want your skin to become dehydrated, oily skin needs hydration as much as any other skin type! Sheets masks are common practice backstage at fashion weeks to give the models skin a last-minute pick me up in their hectic schedule to ensure the skin is looking plump with a youthful glow for the show. One thing I will say … there is literally no way to make sheet masks look cute. So if you are in that phase of a relationship where you are still ‘discovering’ things about each other, I’d save the sheet masks for some me-time. Will you be adding sheet masks into your routine? Scroll down for my favourites! > 20 minutes max – you do not need to use sheet masks for longer than 20 minutes, they reach their maximum efficacy. > DO. NOT. RINSE. – Don’t rinse all the goodness off after sheet-masking. Start with cleansed skin, apply your sheet mask and after 20 minutes remove and follow with your daily moisturiser to seal in all the benefits from the mask. > Exfoliate before using a sheet mask for maximum efficacy. > Keep your sheet-masks in the fridge for an extra pore-tighenting effect. This sheet mask is a bit of a game changer as it is DRY so can be REUSED (up to 3 times) because it doesn’t harbour bacteria. Designed to hydrate, lift, reduce wrinkles, smooth & brighten, apply the mask to cleansed skin – it has genius little ear hoops so it stays in place and smooth to your skin giving it maximum effect with zero mess. This masks feeds your skin what it needs and keeps feeding it for 8 hours, your skin definitely looks plumper and more hydrated after using. I would use this before being photographed because it doesn’t leave and greasy residue on your skin. The Jasmin Absolute in this sheet mask is divine, I love the scent so much. 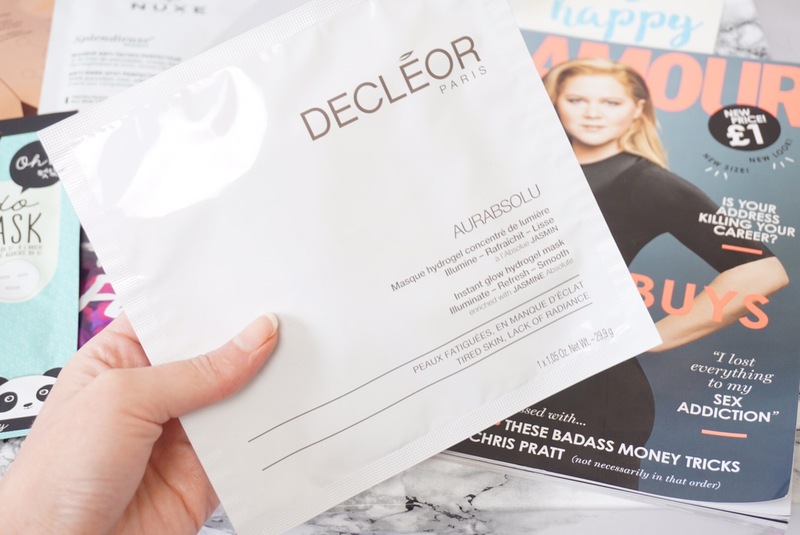 Decléor’s Aurabsolu sheet mask comes in two parts, so it’s fuss free and easy to use. As I’m sure you can guess from the name – it is a gel based sheet mask. Think of it as an at home facial – in just 10 minutes your skin will be rejuvenated, and glowing with natural luminosity. Using the purest form of Jasmine Absolute, Decléor Aurbsolu Mask Intense Glow Hydrogel Mask gives you instant radiance by tackling dullness. This sheet mask is all about getting your glow back. Made in Korea, where sheet masks are a daily part of skincare regimes. Oh K!’s Cucumber & Avocado sheet masks are exclusive to Boots and are great value at £3! The packaging is super cute, I would definitely invest in these if I was having a DIY pamper session with the girls. In fact, I am sitting with one of these on as I write this post … and it’s not slipping off my face. The Cucumber mask is formulated to give intense cooling and sooth tired skin leaving you feeling fresh faced and glowing, while the Avocado mask is formulated to nourish and give a silky complexion. If you feel like your skin needs a bit of a detox, this is the sheet mask for you. 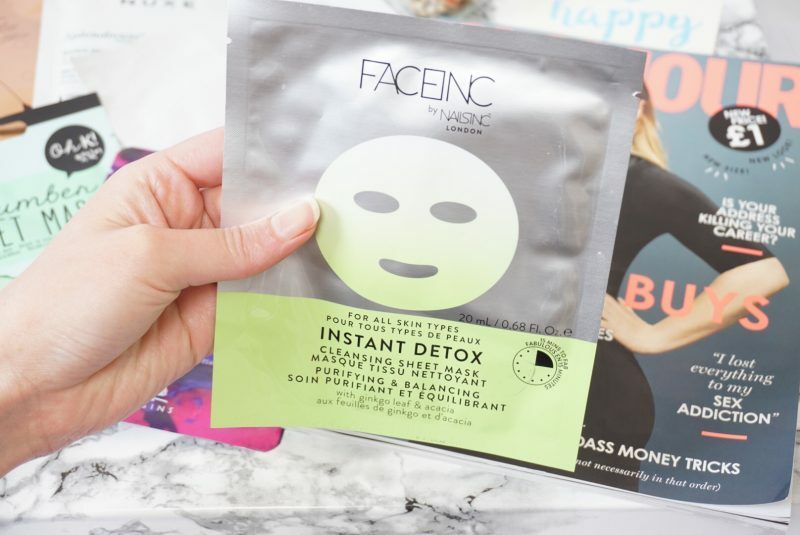 Purifying and balancing your skin, the Instant Detox Facial Sheet Mask is for all skin types. 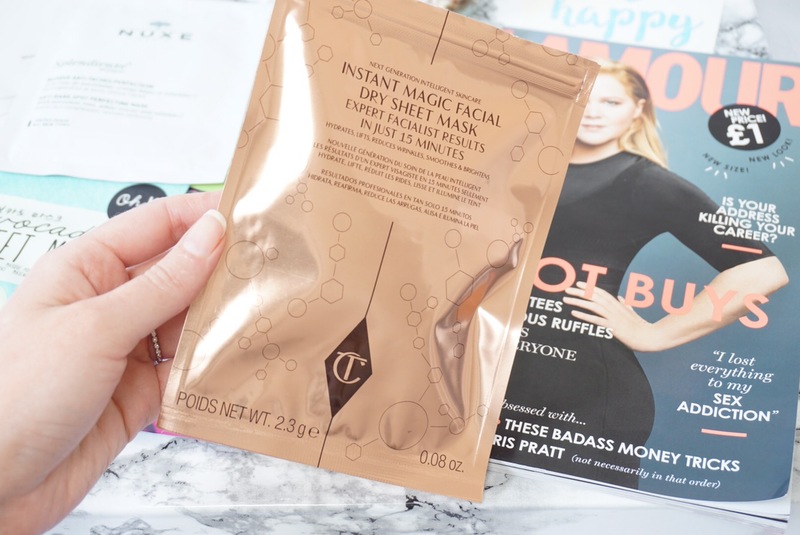 Removing visible imperfections, Face Inc by Nails Inc Instant Detox Cleansing Sheet Mask is packed with antioxidants to help refresh skin. In just fifteen minutes, dull skin is reversed and re-balanced leaving a soft, smooth and hydrated complexion. Enriched with Acacia & Ginkgo Leaf to exfoliate and reduce visible imperfections, Chamomile to soothe and Hyaluronic Acid to plump.